QuickHeat Hand Warmer is a small electrical device that functions like heated gloves, working quickly and offering a range of temperatures. What is the QuickHeat Hand Warmer? What Benefits Does the QuickHeat Hand Warmer Have? One of the most important things in any survival situation is heat. Being too cold opens you up to problems such as colds, influenza, and hypothermia. Packing clothes for every weather is one option, but you need something for quick emergency situations. This is where the QuickHeat Hand Warmer from Survival Frog can help. To put it simply the QuickHeat Hand Warmer is a small electrical device that keeps your hands warm. It functions like heated gloves; a common emergency supply. While these gloves only offer one temperature and can take a while to get started however, the QuickHeat Hand Warmer gets to work quickly and offers a range of temperatures. It takes up much less room as well and has other features that make it such a valuable tool. Safe to Use – One problem with the aforementioned disposable hand warmers is that they can cause burns. The QuickHeat Hand Warmer has safety features built in that turn it off automatically if the temperature gets too high. The anti-scald, anti-skid, radiation-free and explosion-proof QuickHeat Hand Warmer is even safe enough to take on a plane. Long-Lasting Heat – One charge of the QuickHeat can give you enough heat to last the whole day. A low setting gives you ten hours of heat, while medium gives 7.5 hours of heat and high offers 4.5 hours. That’s more than enough to get your body the heat it needs to keep you alive. Quick Charging – The QuickHeat is charged using a USB wire that plugs into a computer or outlet. The device is fully charged within a few hours, which means you’re never stuck waiting around for heat when you need it. Durable – Given that the QuickHeat contains no moving parts and is made from tough and durable ABS plastic and aircraft-grade aluminium you can count on it to survive any situation. Every true survival tool needs to be able to handle being dropped and kicked, and this can do just that. Comfortable – The rounded design of the Survival Frog QuickHeat Hand Warmer makes it comfortable to hold or store in pockets and socks. 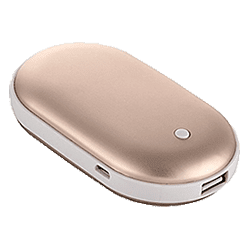 Portable Charger – Another advantage of the QuickHeat Hand Warmer is that it works as a portable charger for your phone or other devices. If you’re in an emergency situation where heat isn’t a problem but you really need to make an emergency call, then hook your phone up to the device and put the power to good use. Survival Frog are known for their excellent survival products and the QuickHeat Hand Warmer is just the latest in a long line of survival essentials. Don’t underestimate the damage the cold can do and how quickly you’ll get cold without traditional heating options. The Hand Warmer is tough, charges quickly, and has three settings to give you just the right level of heat you need to stay comfortable, if not alive, when things hit the fan.